Hairless pets are at increased risk of developing infections, sunburn, dry skin and other skin conditions that can make them very uncomfortable. Fortunately, it's easy to prevent these conditions by following these important tips. Hairless pets and pets with only one coat of hair, such as greyhounds or chihuahuas, need more frequent baths than furry pets. Baths wash away pollen, dirt, bacteria, debris and pollutants that collect on exposed skin and cause irritation, skin allergies, and bacterial or fungal infections. Bathing also helps keep natural skin oils under control. Have you ever noticed an oily spot on your bed or sofa after a visit from your fur-free pet? Skin oils are absorbed by hair in most pets but remain on the skin on hairless pets. Although oils help keep skin soft and supple, too much oil can clog skin follicles, triggering an outbreak of acne or blackheads. Bathing your pet every week or two is a simple way to reduce oil buildup. During the bath, concentrate on removing dirt and oils from the folds that can hide these substances. Keeping folds as clean and dry as possible is the key to preventing bacterial and fungal infections. If you end up covered with scratches when you bathe your cat, you may be able to reduce the frequency of the baths if you wipe his or skin with a moist washcloth in between bathing sessions. Although bathing your pet often is a must, frequent trips to the bathtub can dry your pet's skin. Use lukewarm water and opt for shampoos that moisturize and condition the skin. Perfume-free shampoos are less likely to irritate your pet's sensitive skin. Use gentle pressure when washing your pet, as skin irritations due to vigorous scrubbing are more likely to occur in hairless pets. Although sunburn can occur if any pet spends too much time in the sun, hairless pets and those with only one coat of hair are particularly vulnerable to the effects of the sun. In addition to limiting walks or outdoor play time to the early morning or evening hours, applying sunscreen can help your dog avoid painful burns or skin cancer. Keep in mind that sunscreens and sunblocks that are safe for people aren't necessarily a good choice for your pooch. Choose products specifically intended for dogs, or try spray-on products designed for children. Products that contain zinc oxide should never be used on dogs or cats, as they can trigger severe anemia. 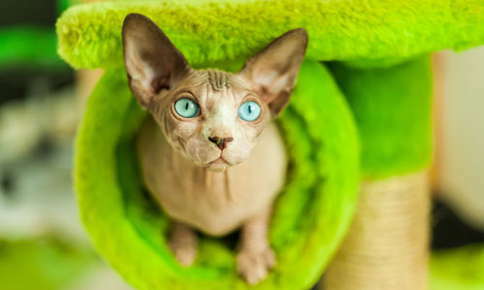 It's best to keep hairless cats indoors, rather than worry about a possible toxic reaction to sunscreens. If you do take your cat outside, ask your veterinarian about safe sunscreen choices. Lightweight coats that cover your pet's entire body are an excellent alternative to sunscreen, although you'll still want to dab a little sunscreen on noses or other exposed areas, such as tails. Without an insulating layer of hair or fur, your pet will feel the cold more intensely. Warm coats can help decrease the chill whether your pet spends all day indoors or ventures outside for walks. Choose a coat or sweater that completely covers your pet's abdomen and extends to the base of his or her tail. If you plan to walk your dog on snowy or rainy days, buy a waterproof or water repellant coat. Even hairless pets can become overheated when wearing coats or sweaters. If your dog or cat pulls or scratches at the coat, or starts to pant, take it off for a while. A heated bed or resting spot will help keep your pet warm if he or she doesn't appreciate the benefits of wearing a sweater. In some cases, pets may refuse to wear coats or sweaters due to comfort issues. Make sure that the garment isn't too tight and doesn't inhibit the ability to move freely. Regular veterinary examinations can help you ensure that your hairless pet's skin remains in good condition year-round. Contact us to schedule your pet's next visit.